Freestanding dishwashers are easy to install, and to use, and will slot effortlessly into an average sized kitchen. Choosing a 12 place setting option will give you more than enough room for a week’s plates and cutlery, and A+ energy ratings will help keep bills down. With a choice of wash programmes, you’ll be able to go for rapid wash modes, or eco selections for efficient cleaning. Even if you think that you don’t have room for a dishwasher there are versions that’ll fit! Slim line dishwashers are the ideal solution for smaller kitchens. Take a look at Bosch and Samsung for dishwashers to save you time and money. Miele has been awarded the best domestic appliance brand on many occasions, and are rated for their quality and long guarantees, but also tend to be quite expensive. For a mid-price to budget price range Bosch and Zanussi are most acceptable, as are AEG. Today’s features include no fading washes, reduced crease washes, soft water technology, and energy saving washes that still clean perfectly. Timed cycles, volume reduction, self-cleaning dispensers, and materials specific cycles can all be catered for, and energy efficient ratings are now outstanding, dramatically reducing fuel bills. There are many different styles of oven to choose from including built-in versions, single options, and double ovens. 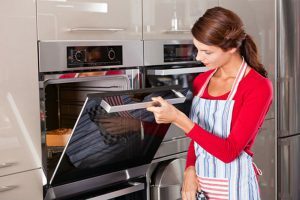 A single oven offers a full range of cooking tasks including grilling, roasting and baking – they’re a flexible choice enabling them to be positioned at eye level or under the counter. Double ovens have two separate cooking spaces, making it easy to perform two tasks at once. With a larger capacity they’re ideal for families, and are generally installed at eye level. For the smaller kitchen you can opt for compact ovens which are about the same size as a microwave. Choose your fuel type from gas, electric, or duel fuel. Some highly rated ovens are manufactured by Samsung, Miele, Indesit, and Stoves. To study a comprehensive range of domestic appliances and their prices before you buy it’s worth doing some research online! Take a look at John Lewis and Peter Tyson Appliances to begin your search – they’ll guarantee a great after sales service and both have reputations of the highest standard. If you choose where you buy your appliance from carefully, you won’t have any problems. If you ever need a specialist appliance repair service on-demand North London Appliance Repairs are the team for you!